As teachers who have taught under No Child Left Behind (NCLB) - the well-intentioned but flawed reauthorization of the Elementary and Secondary Education Act (ESEA) - we have seen this law fail to reflect the realities of the classroom and the need of our students. 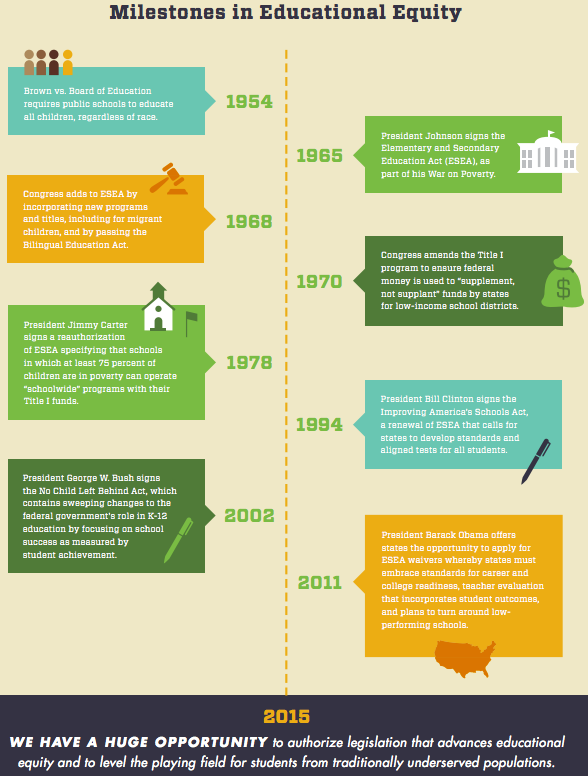 The Elementary and Secondary Education Act presents an opportunity to advance educational equity. Now we have the chance to make sure that doesn't happen again–by promoting thoughtful, teacher-created ideas to our Senate and House Congressional members on behalf of the diverse population of students federal law must serve. Our classroom experiences drive us to seek not only school accountability for traditionally underserved students, but also the resources and opportunities to ensure all students are reaching their full potential. Prevent the dilution Title I dollars for high-poverty schools by keeping the Maintenance of Effort provision, increasing Title I funding and denying the portability of Title I funds. Strengthen school accountability for traditionally underserved students by maintaining required statewide assessments for all students in grade 3-8 and once in grades 10-12, with flexibility for states to intervene in schools failing to serve student subgroups. Use Title II funds to promote teacher leadership through hybrid teaching positions and incentivize an equitable distribution of effective teachers by rewarding high-performing teachers to teach in hard-to-staff subjects or schools. Under portability, Title I grant funds would follow a student, leaving high-poverty schools with fewer resources. We are a team of 11 educators from across the nation who worked together over the course of several weeks to review research on ESEA, federal funding, and teacher career pathways. We drew on E4E’s past policy papers, as well as our own experience in the classroom, to find themes related to ESEA and prioritized them in crafting our recommendations.